Premium Break Resistant Dress Hanger - Clear - 17"
As one of our most popular styles, our 17" premium plastic dress hangers are heavy duty and break resistant to withstand even the most severe use. Designed from K-Resin, the plastic dress hangers have a securely anchored, bright metal swivel hook to save space on clothing racks. They also feature notched shoulders to securely hold the straps of any size or style dress. 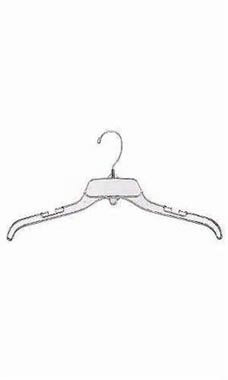 These heavy duty plastic hangers are a wise and practical choice for your clothing display needs, sold in cases of 100. I really like these, little more durable than the regular hanger. These are pretty typical hangers. They seem to be good. Nothing special about them, but I haven't had any problems with them. Truly unbreakable! These are great for the traveling division of my clothing boutique! These hangers are very durable. We haven't had any break so far. These were what we expected, and did good. Hangers are great, they serve the purpose we needed them to serve. Good product for the money. I am very pleased with the quality. Break resistance helps keep costs down. They are substantial. I like that. Hold even heavier garments. Definitely worth the money. Very good quality. I bought these for my boutique and they are very sturdy! I've compared quality, list price, and shipping prices with all the companies out there, and these hangers are the best value. They hold up very well. I've ordered cheaper hangers from other sites and they break constantly. Best value I could find. I couldn't believe how quickly they arrived! Everyone else was at least a week out. I had my product in two days. These hangers were perfect and a great value for the price. Customer service is top notch. Product is as advertised. I am a repeat customer because of CS and product selection and quality.